I am taking a graduate biochemistry course while getting caught up with TWIV (new twiver) and TWIV is complementing my coursework nicely. I just had an exam on protein structure and the material links up with a lot of your topics. 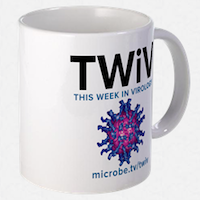 TWIV is informative, on target, funny, and even holds my polisci friend's attention.